Seton Hill University raised $8,212.53 during the 2015-2016 NCAA Division II Make-A-Wish record-setting fundraising campaign. The fundraising campaign set a new record for Division II for the fifth straight year after raising more than $608,000. The Pennsylvania State Athletic Conference led all conferences with $66,893.48 raised. "We are very excited for our upcoming wish reveal and look forward to granting more wishes in the future." "The Student Athlete Advisory Committee has come very far in our efforts and accomplishments for the Make-A-Wish Foundation," Student Athlete Advisory Committee President Emily Hutsko said. "I am so proud of all the hard work our members put forth to raise funds for such an amazing cause. We are very grateful for all those who donated and made this accomplishment possible. We are very excited for our upcoming wish reveal and look forward to granting more wishes in the future." 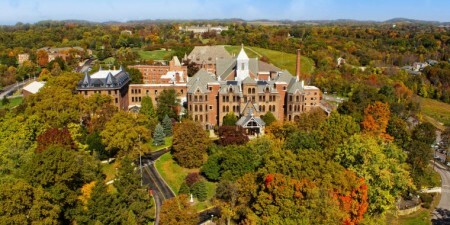 Seton Hill ranked eighth out of 238 institutions in raised funds. The Griffins raised the second highest total in the PSAC behind Edinboro who finished second in the country. Seton Hill will have the opportunity to host a wish reveal since they raised more than $5,000. The wish will be revealed on April 22nd between games of the baseball team's doubleheader. Visit setonhill.edu/athetics for more Griffins news!